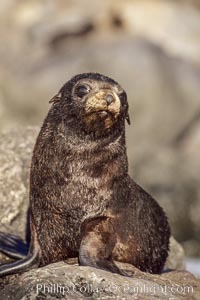 Pup Guadalupe fur seal. A robust colony, including pups, has been seen at the Islas San Benito, an island group over a hundred miles east of Isla Guadalupe and much closer to the Baja California coast, continuously since at least 1995. This is an exciting development, an indication that the Guadalupe fur seal is regaining some of its former, pre-sealing territory.